The shower or tub area can get quickly inundated with products, scrubs, brushes and more, and it can become dangerous as well as hard to clean. I know on bathroom cleaning day I used to dread having to move all the product bottles off the corners of the tubs so I could get into the corners and clean. 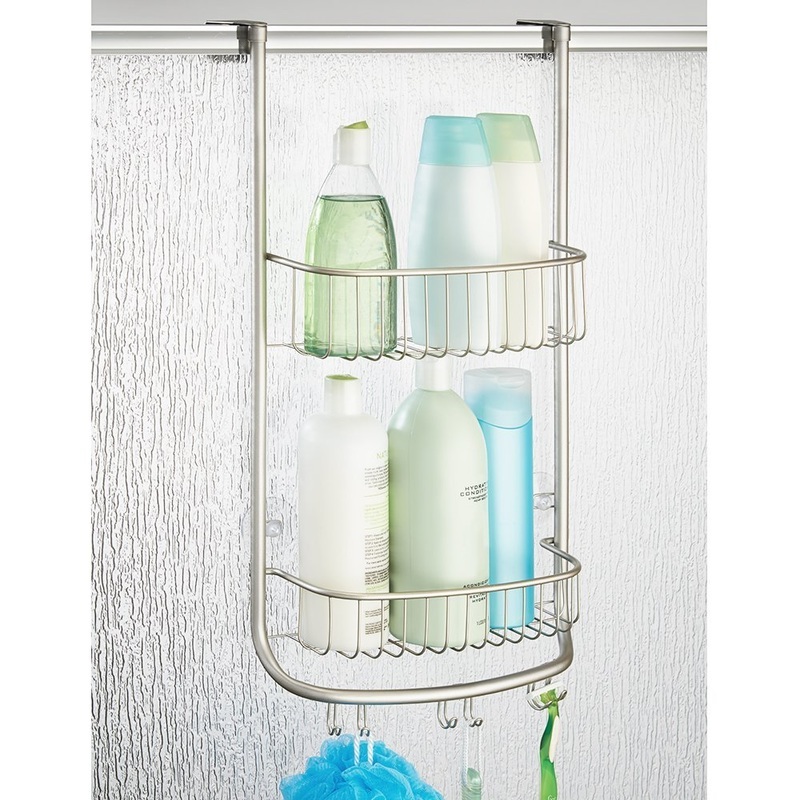 You can get corner units that are spring loaded so as to not damage walls, as well as shower caddies that do a good job as well. It all depends on your space and where it works best for you. Personally I like the units that hang right off the shower head so the shampoo and soap are front and center, but everyone is different. Here are some affordable ways to get those bottles off the floor, corners of tub, or where ever they have been accumulating. This one is the most popular and works best in a tub with shower area. It fits in the corner and makes it easy to grab the products you want. Have a good clean out first, get rid of products not in use, as they take up a lot of room, then assign a shelf to each person in the home. These make it easier to clean the area and don't damage the tiles or tub. This one is my favourite and one I use right now. As long as your shower and plumbing are in good shape you can hang one of these units over the connection. I like them because I can see what I need right in front of me rather than looking elsewhere. There is not a lot of space but it holds enough for myself. 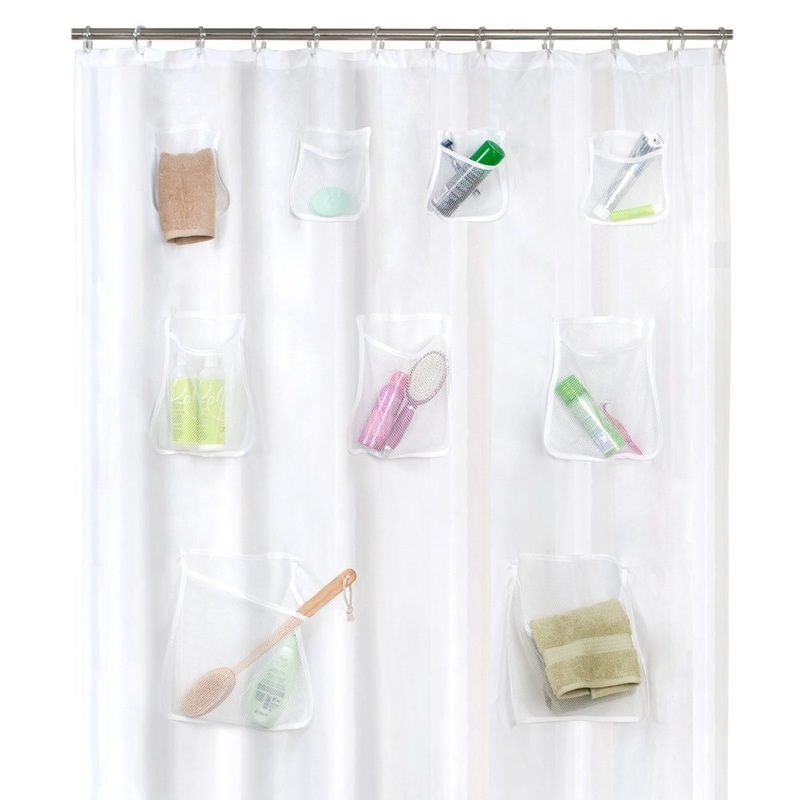 This shower curtain comes complete with these pockets, so that everything you need is handy. No need for extra shelves, or caddies. 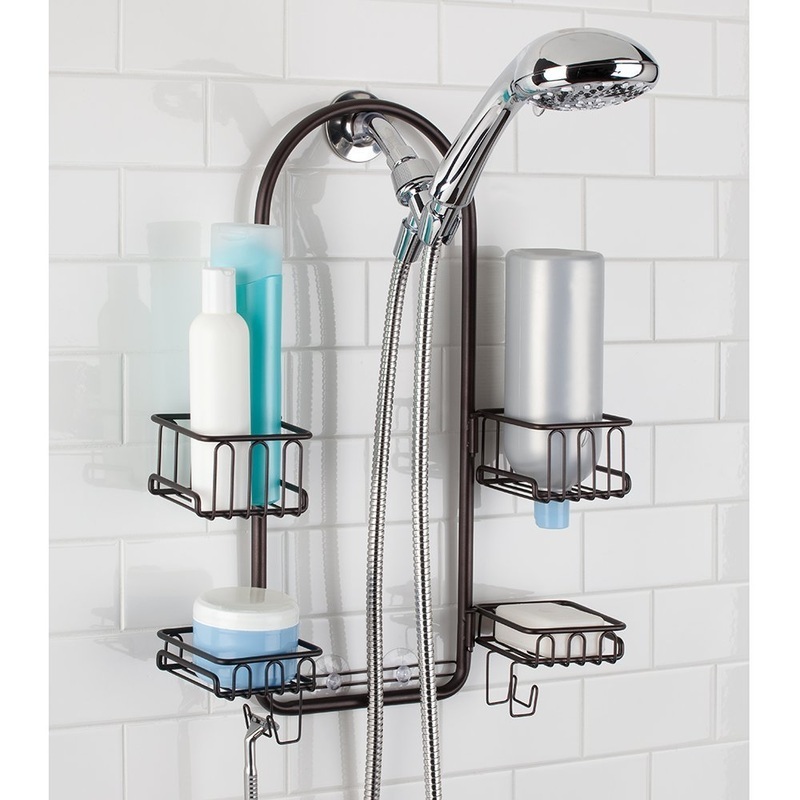 I thought this was a brilliant idea for anyone looking for extra storage in the tub or shower area. 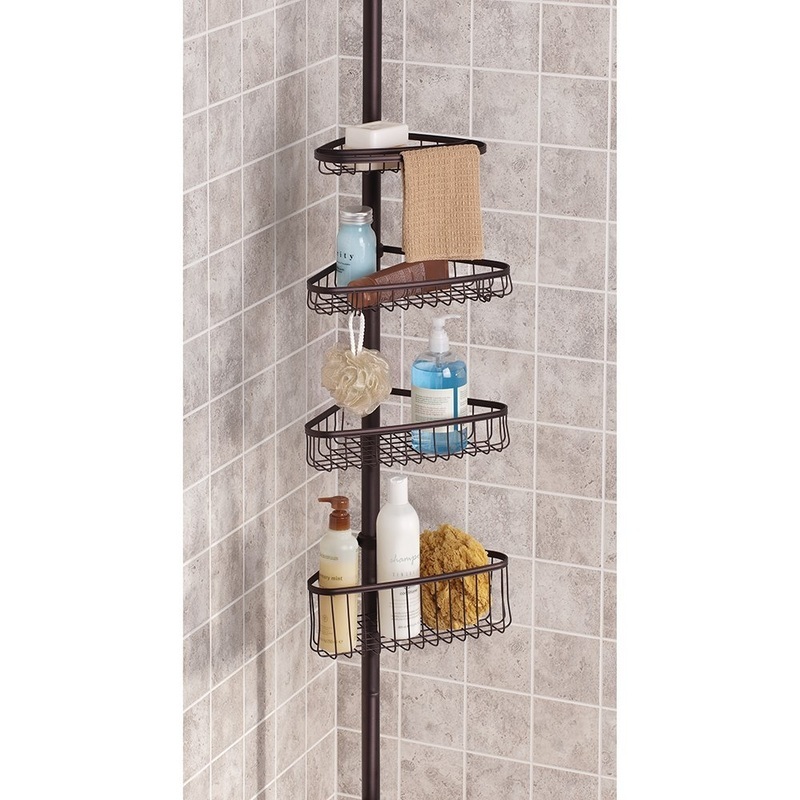 If you are not a fan of corner shelves or shower caddies, this is something worth checking out. An affordable way to have everything you need right there and easy to put away. 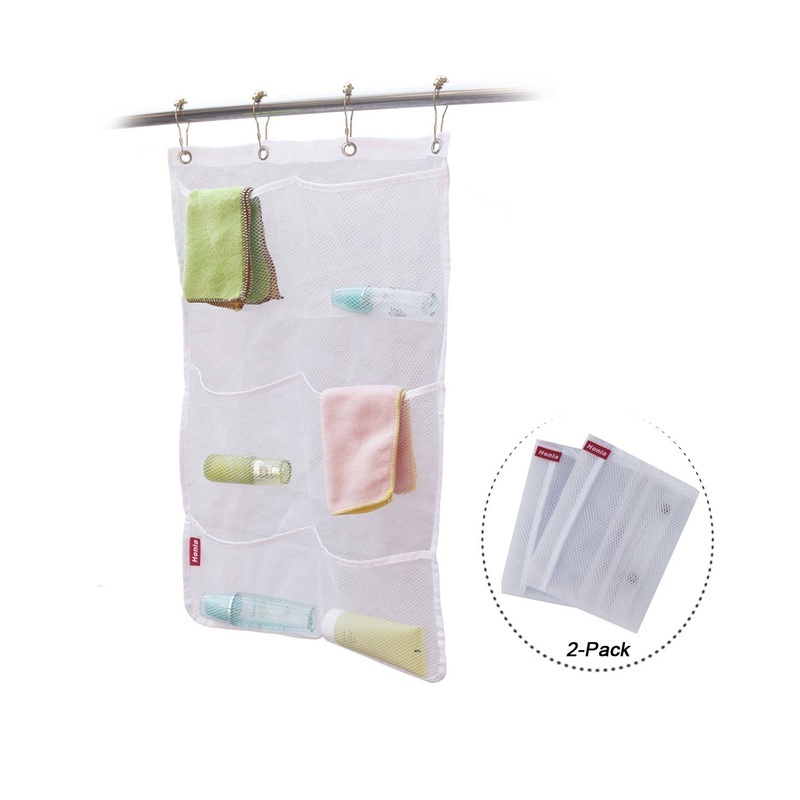 This is a portable hanging mess caddy that fits onto the same rail as your shower curtain. This makes it handy and ready to use once you have drawn the shower curtain. If you rent or simply want something hanging to the side of you with everything in plain sight, this is another affordable option. If you have a shower with a door instead of a curtain, it may or may not have built in shelves. If not, this unit will fit right over the door ready for all your products with hooks at the bottom for anything else you may need. Looking for something a little more rustic? This teak unit will hold a lot of your products. Teak is totally safe with water so it will last a long time. But it is definitely something a little different looking. It fits over the shower head and looks good. 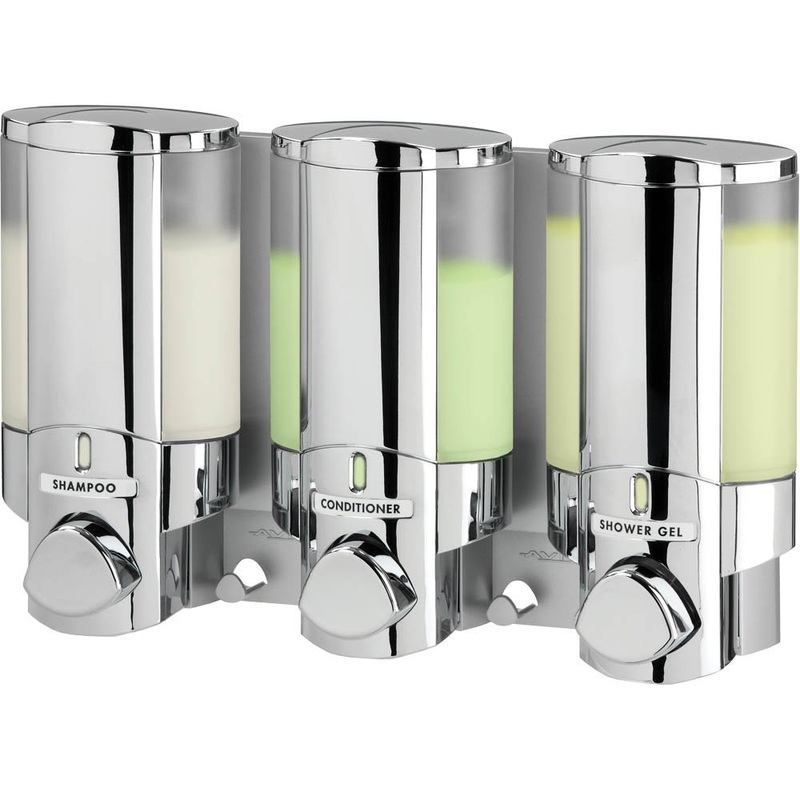 Another option is to get rid of bottles and clutter all together and simply add this dispenser unit to your shower. It installs without construction with silicone and two sided tape and holds well according to reviews. Simply put it at the level that works for you and then fill the units with your products. Store the bottles elsewhere. This cleans up your shower area, and makes it easier to get your products without having to flip caps. There are so many really cool options available to create storage and organization even in the tiniest of bathrooms! I moved a lot in the last few years and rented spaces that were so tiny storage was an issue. But after much online research I discovered ways to utilize every square inch into useful storage without renovation or construction or damage to walls. I absolutely love the idea of a roll under the pedestal sink vanity for extra storage, and then there is the space above the toilet for other things. The best thing of course is to have a good clean out, which I did when we moved so much, it makes it easier when it comes to bathroom storage ideas. 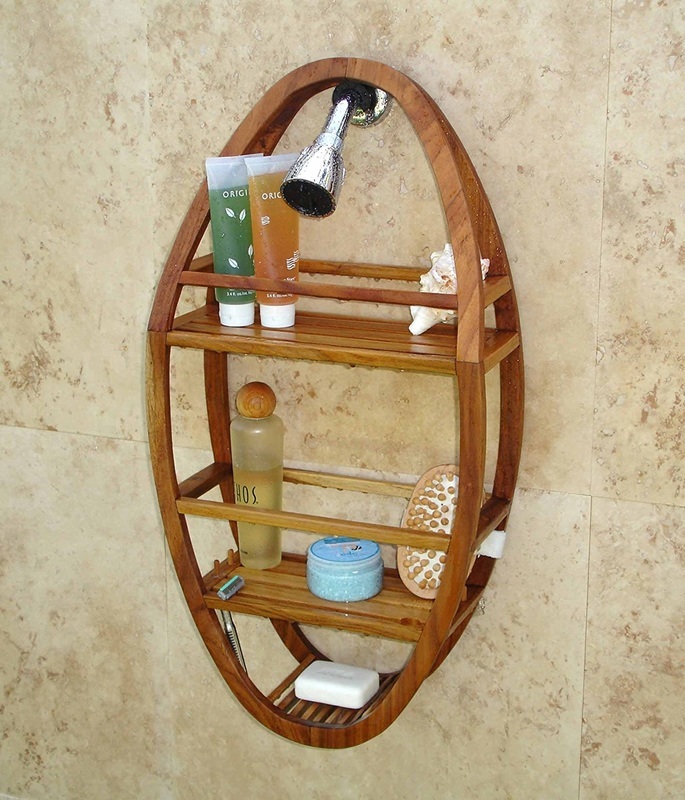 Vanities can get cluttered and there are really cool cosmetic carousels that are user friendly and work like a charm. Toilet Paper storage can be another issue, but there are ways around that too. I need things in a place where it is easy to get, not tucked away or they will end up staying out. So once you know your personality and the things you need to store, start checking online. I found Amazon to be the best with the most variety and easy ordering and shipping.